Simple Photo Converter is a free Windows 8 Batch Image Converter app that lets you convert your image files from one format to the other. Using this free Windows 8 Batch Image Converter app, you can convert single or multiple RAW, JPG, PNG, BMP, GIF, and TIFF files easily. Not just this, you can also rename these files together, using this free Windows 8 app. We had recently reviewed a similar app called Image Conversor. Simple Photo Converter is another useful app capable of converting bulk images from one format to the other. You can browse image files on your system, select multiple images, and convert them into the desired file format in just one go. The converted images get saved in your Pictures folder by default. 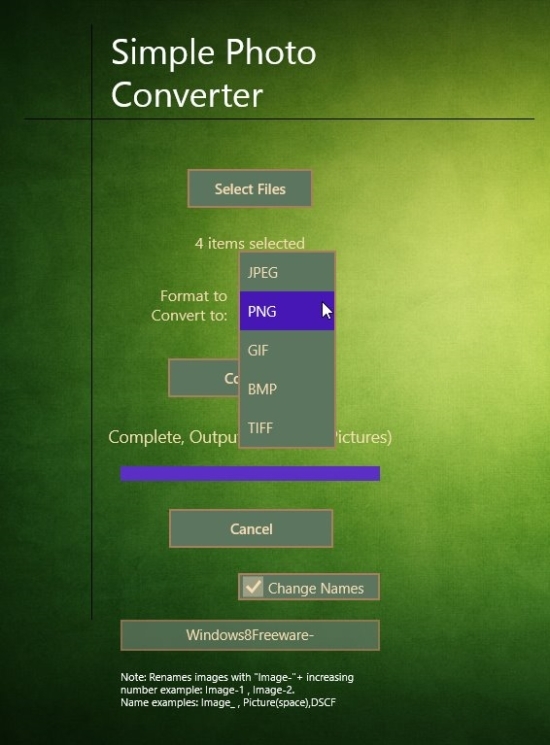 Simple Photo Converter is freely available in Photo category of Windows Store. You can also view it directly in Windows Store by clicking on the link given at the end. Let’s see how you can convert image files using this image converter app. To convert your image files from one format to the other using this free Windows 8 Batch Image Converter app, first install the app on your Windows 8 system. As you launch the app, you will see the Start screen of the app with options Select File, Format to Convert to, and Change Names. An advertisement will also be displayed on the right side of the screen, which you can simply ignore. Click on Select File to browse and select the image file/ files you want to convert or rename. The number of images you select will be displayed on the screen. Select the desired output file format using the dropdown of option Format to Convert to. You can rename the image file/ files to be converted. For this, click on Change Names. A window will appear in which you can type a new name. If you are converting bulk files, give a new name to an image and the app will automatically rename rest of the files, by assigning an increasing number to the subsequent images. 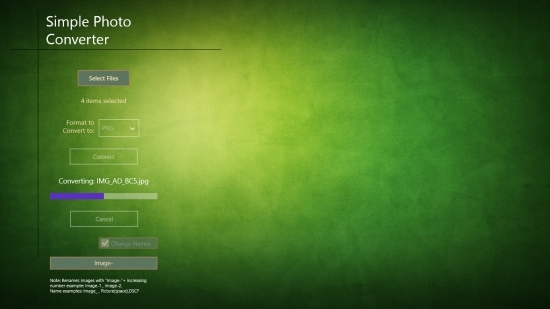 For instance, type ‘Image-‘ in Rename window. The converted files will be automatically named as Image-1, Image-2, Image-3, and so on. Click on Convert button. The app will quickly process the conversion. The converted files will get saved in your Pictures folder by default. This is also indicated on the main screen of the app. You can also cancel processing by clicking on Cancel button. Simple Photo Converter is a nice free Windows 8 Batch Image Converter app that helps you convert single or bulk image files from one format to the other. The app is also capable of renaming bulk image files. Give it a try. Do share your feedback via comments. Get Simple Photo Converter here!